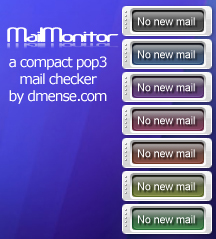 MailMonitor is a tiny mail checker widget for your desktop, it allows you to run multiple instances in order to monitor multiple pop3 addresses at one time. It is colorable via clicking the gripper. I agree with post 1, very nice. you can right click the widget,select properties then fine tune the color via "hue shift"
A very practical and attractive widget. But it would be even better if it would check my IMAP and web-based emails too. Nice. How do you run more than one? cant figure that out. Still using this, for more than a month. For me that's a long time to not change something. So simple, yet does the job I need done, flawlessly. Could not ask for more. Thanks!